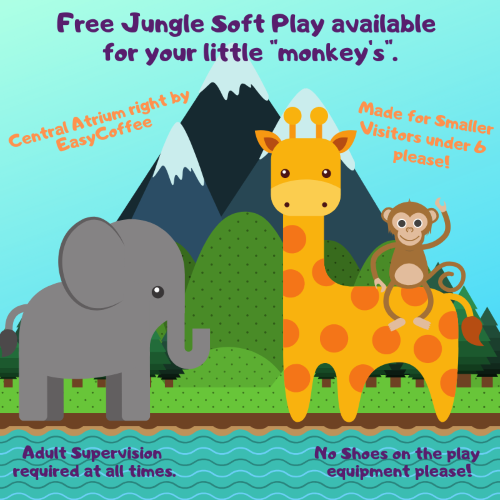 We've got you covered with a Jungle Soft Play for the kids to burn off some steam ! If they are getting bored or cranky just head to the Central Atrium for 10 minutes play time - guaranteed to wear them out so you can carry on with what you want to do! The Soft Play isn't supervised, except by parents/carers so please stay with your children. Plenty of seating to watch them play safely. We would ask no BIG KIDS please - this area is recommended for age 6 and under. Please play in socks, no shoes on the equipment, thank you. If you notice a spillage or something needs attention please speak to a member of the EasyCoffee staff in the first instance. Toilets and babychange facilities very close by as well for your comfort and convenience.